Tablet weaving is a very popular technique for weaving narrow bands for belts or trim. It is a weaving technique that requires very little investment beyond the actual thread for the product itself, making it affordable for many of us. Yet, despite its deceptive simplicity, there is an enormous richness in variation, techniques, and concepts to create an infinite variety of beautiful patterns and designs. I can highly recommend getting a copy of Peter Collingwood’s The Techniques of Tablet Weaving. This book is still available in reprint and is an excellent reference book on tablet weaving, both for a beginner and an experienced weaver. Brocading is just one of many tablet weaving techniques that are discussed. Most of the information in this handout is derived from this book and I will stick to his notation as closely as I can. Figure 1: Warp from the Tegle find (Stavanger Museum). Figure 1a: A diagram showing the starting border and the probable warping method. In his book, he presents a chronological list of the most important historical finds from the earliest ones in bog burials in modern day Germany dating back as far as the 6th century BC and up to the year 1000 AD, after which too much material survives to make a brief summary feasible. Given my interest in warp-weighted looms, I find it particularly exciting that the earliest pieces of fabric that are positively identified as tablet woven are from the starter borders of textiles that were woven on a warp-weighted loom. In this context, Figure 1 shows the most unique example that I know of: the Tegle find, a complete warp found in Norway and dated to 445 to 545 AD. See Figure 1a diagram, right, for the starting border and probably warping method. 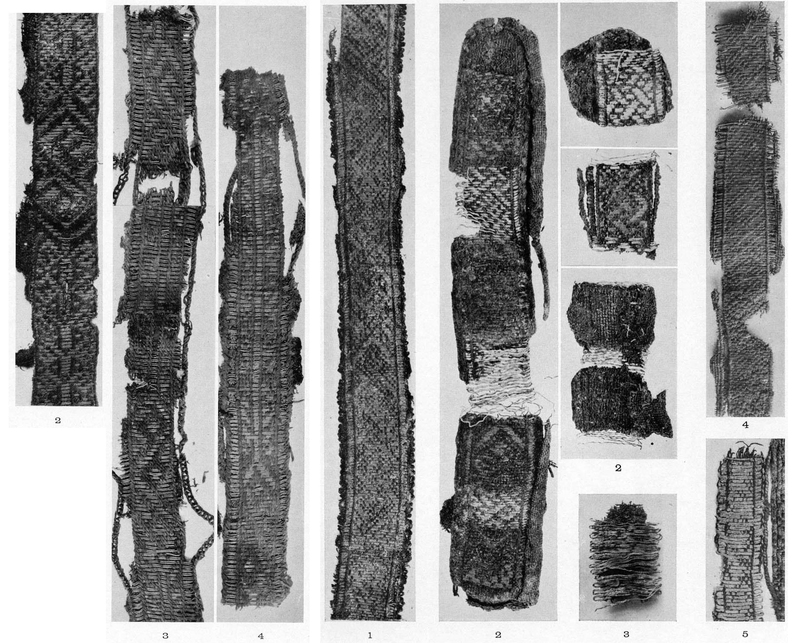 Another famous example is shown in Figure 2, a linen brocaded band with its warp still threaded to a set of 52 tablets, found in the Oseberg ship burial in Norway and dated to the 9th century AD. Figure 2: Set of wooden tablets with attached warp from the Oseberg ship burial. The last example I must include in a class on brocading is the enormous wealth of artifacts found in the archaeological sites of the Viking settlement Birka on the island of Björkö in the Lake of Mälar in present-day Sweden. For almost two centuries, from about 800 to 975 C.E., Birka served as an important trading center between Viking-age Scandinavia and Western Europe and the with the Orient through the trade routes in Russia. 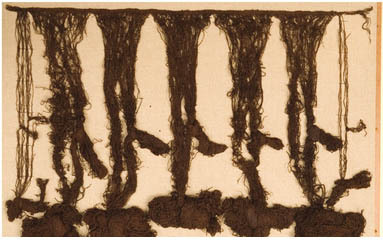 Agnes Geijer published an extensive survey of the textile fragments from the Birka graves . This publication contains a complete chapter on the Birka bands (see figures 3 and 3a for examples of some of these bands). Figure 3: Examples of several Birka bands. 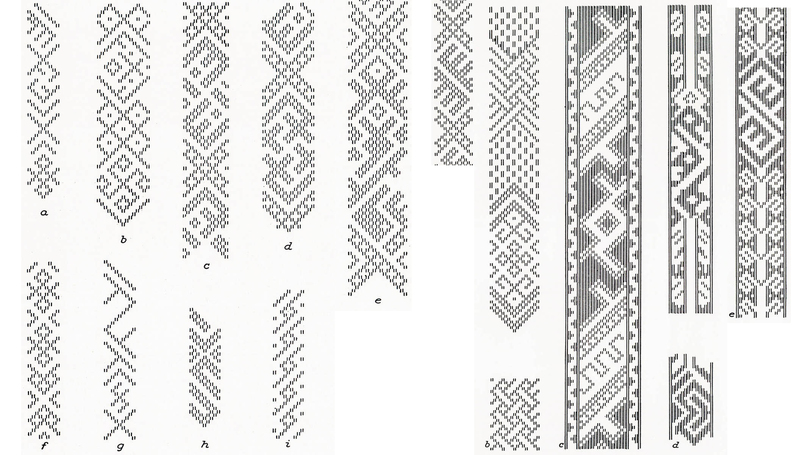 Figure 3a: Several Birka patterns. Tablet weaving is a technique to combine warp and weft by using tablets to create a shed. The tablets can be made from a variety of materials and in different shapes. Historically, commonly used materials include wood, bone, ivory, and leather. Their shape was most often square with rounded corners and a hole in each corner. Their size varied but was typically on the order of 5 cm or 2 inches. A cheap modern alternative is tablets made from playing cards cut to a square with rounded corners and a hole in each corner. The warp consists of the combined threads through the complete set of tablets, one thread through each hole, so four threads per square tablet (if all holes are used). The number of tablets varies; for brocading, it is often an odd number to allow for designs that are symmetric with respect to the center tablet. To maintain tension on the warp we need a means to secure both ends of the warp at a given distance apart. The simplest way of doing so is by tying one end to your belt and the other end to a fixed object, like a tree or a door knob. When the length of the warp decreases during the weaving, you simply move towards the fixed end. The finished band can be rolled on a peg that is tied to your belt. One advantage is that it requires only the bare minimum of equipment: just a set of tablets and a beater will do. Another advantage is that the weaver has complete control over the warp tension by moving slightly forward or backward. The main disadvantage of this method is the difficulty to weave complex designs or wide bands with many tablets. 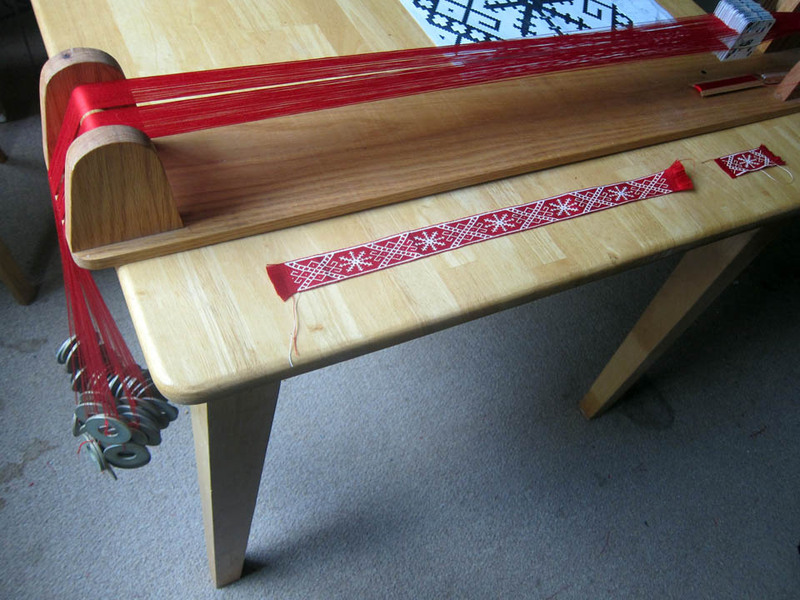 Figure 4: My warp-weighted tablet weaving loom. A more common method has the warp fixed at the endpoints of a wooden board, either clamped in some way or wound around a rod or peg that can be locked in place by a clamp or a ratchet. The weaver sits at one end or on the side, and every now and then the finished warp is collected at the end towards the weaver by loosening both ends, pulling the warp towards you, and retightening it again afterwards. This periodically adjusting of the warp allows for a good body posture with the tablets always within comfortable reach. 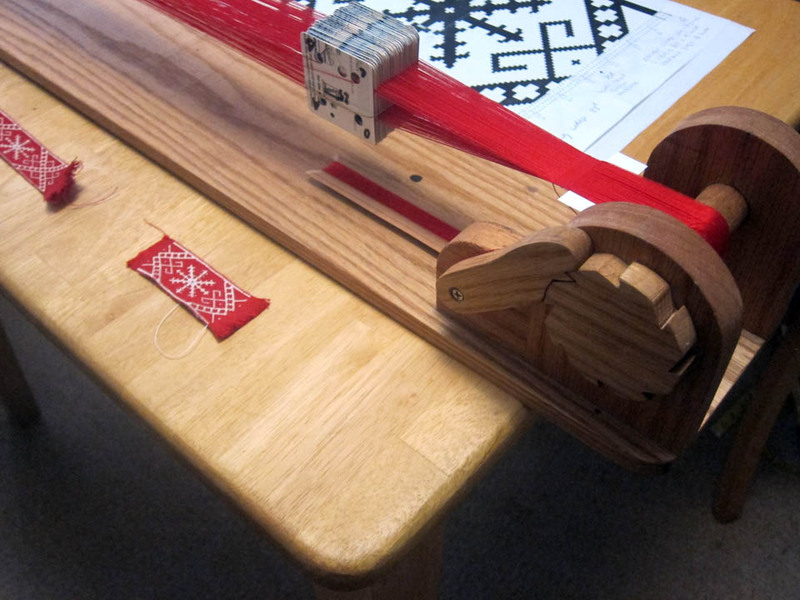 Figure 4a: Another view of my warp-weighted tablet weaving loom. A variation on this concept, the one that I will teach in this class, is by having the warp tension maintained by gravity. The near end of the warp is wound around a horizontal rod, which is locked in place between each readjustment of the warp (in my case by a ratchet at one end of the rod). The far end is hanging freely over a second horizontal rod mounted at the end of a wooden board, suspended by a single weight for each cord (the set of threads through all the holes of a single tablet). This warp-weighted tablet weaving method has several advantages. The warp tension is very nearly constant during weaving and the weaver has a lot of control on the amount of tension by using different weights. Surplus warp can be braided before tying each cord to its weight, thus giving a lot of flexibility in the total warp length. 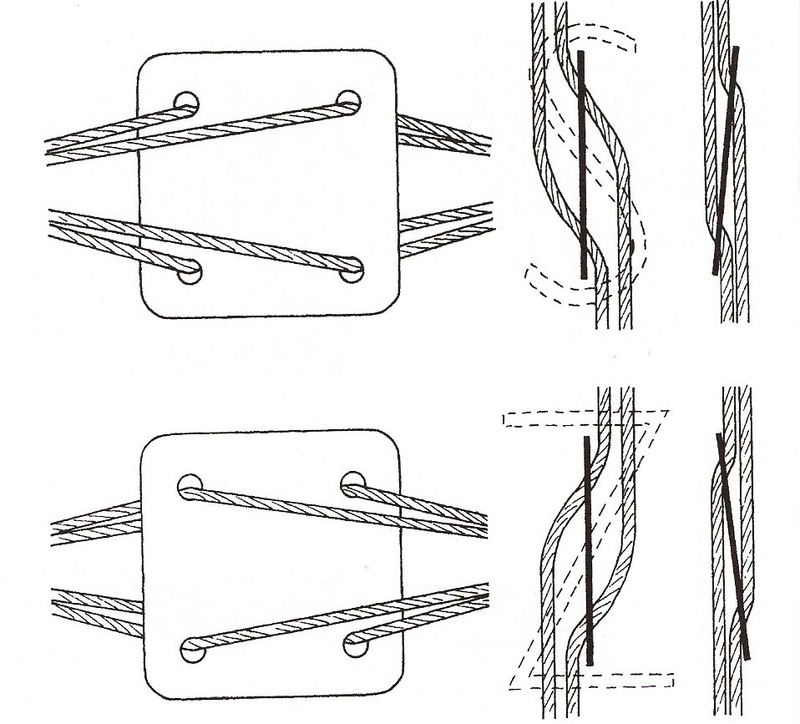 Buildup twist (the origin of which is discussed below) can be removed easily without untying the weights or removing the warp from the loom. This facilitates weaving designs or using techniques that are not twist neutral without the need to change the turning direction of the tablets periodically (which often leads to a discontinuity in the pattern or a visible change in the surface texture). One big downside that I have found so far is that traveling with a warped loom is not an easy task. 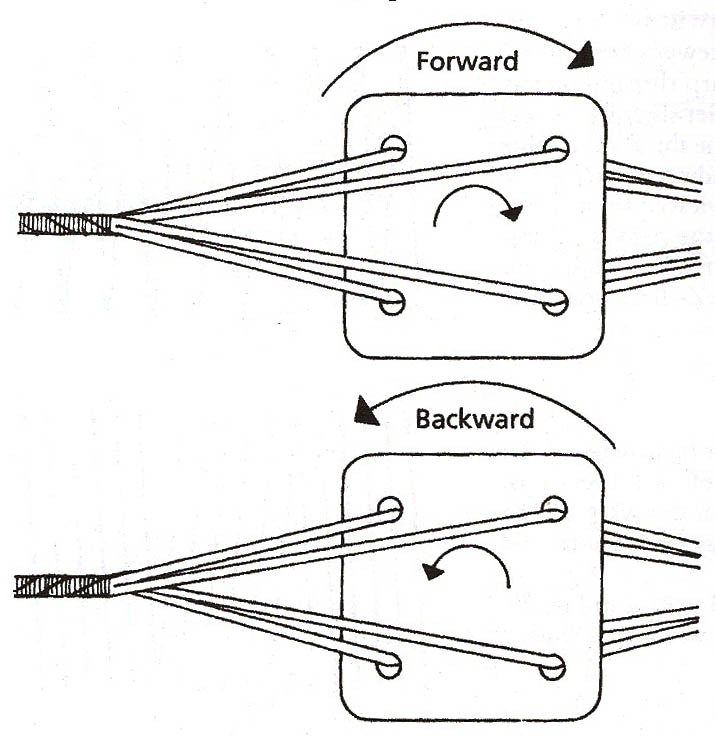 Figure 5: Warping the loom with one loop through two holes at the time. Peter Collingwood (2015) discussed several ways of warping the loom. I picked the one that I think is the easiest to learn. The idea is illustrated for tablets with four holes. Clamp the loom in place on a table on one side along the long direction and clamp two boards with pegs at the other end. Start by going through one of the holes of the first tablet, loop around the horizontal rod near the weaver and go in the opposite direction through the second hole. Keep pulling the thread and wind around as many pegs as needed to get the required warp length. End by tying it to the last peg. Follow the same track around the pegs with the other end and cut and tie it around the last peg as well. Repeat for holes three and four and so on for the remaining tablets. After completing the warping, surplus warp can be braided such that (after tying on the weights) the ends of the cords hang freely just above the ground. Complete the warping by rotating the loom such that the warp ends hang freely, and then tie on the weights, one at the end of each cord. After weaving for some time and collecting the woven band on the rod nearest to the weaver, the weights will reach the level of the table. That is the time to feed more warp by loosening part of the braid. The most important part to remember is to always pass all threads through the holes from the same side of the tablet as seen from one end; otherwise, the tablets will not turn! As the weaving progresses, you need to periodically undo some of the braiding and lower the weights to allow the warp to advance on the loom. Each tablet can be threaded in one of two ways, either “Z” or “S,” named after the way the thread direction through the tablet looks when viewed from above. This is illustrated in Figure 6. Figure 6: “S” (top) or “Z” (bottom). The colors of the threads through each tablet. The position of these colors in relation to those in neighboring tablets. The direction in which the thread pass through each tablet. The direction in which the tablets are turned during the weaving. Only the first one has to be decided while warping the loom. The other three can be changed at the start or even during the weaving. Tablet weaving in its simplest form is a repeating sequence of just two steps: 1) passing the weft through the shed, and 2) turning the tablets either forward or backward, thus creating a new shed. Here, I limit the discussion to square tablets and quarter turns after each pick. Figure 7: Forward and backward turning. For differently shaped tablets or more complicated turn sequences, I refer to Collingwood. The forward and backward turning is illustrated in Figure 7. The shed is formed by the space between the two threads from the top holes and the two from the bottom holes of each tablet. As a result of turning the tablets, the threads from each tablet will start to twist, thus locking the weft in place. 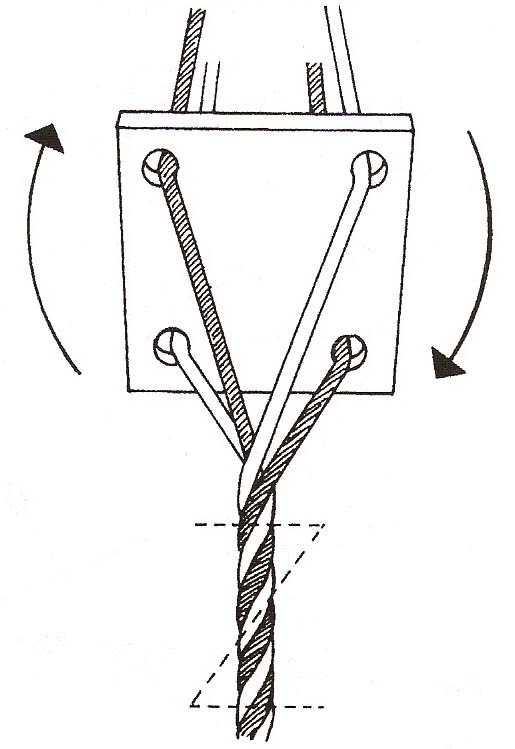 Figure 8: Twining direction of the cord. Figure 8 illustrates how turning the tablets is related to the twining direction of the cord. Turning each tablet clockwise (as shown) will give a “Z” twined cord; turning the other direction will give an “S” twined cord. So, interestingly, both an “S” threaded tablet turned forward and a “Z” threaded tablet turned backwards give a “Z” twined cord. The easiest way to change the twining direction of the cord is therefore to change the turning direction of the tablets. This is very relevant once you realize that turning the tablets leads to twining of the cord on both sides of the tablets; so, during weaving, you build up twist in the unwoven part of the warp behind the tablets. Without doing something you will end up with so much build-up twist that you cannot turn the tablets anymore. A common solution is to periodically change the turning direction to remove the build-up twist. Looking at the table above, another way to change the twining direction of the cord is to flip the tablets from “Z” to “S” and visa versa around a vertical axis through the center of each tablet. One advantage –what I consider to be a big one — of warp-weighted tablet weaving with individual weights per cord is that you can easily remove buildup twist without changing the turning direction or tablet orientation. You simply lift the end while keeping tension on the cord, place a finger in the shed behind the tablet, and push out the twist by sliding your finger towards the end of the cord. The weight will spin freely to release the build-up twist. One last aspect to address here is why most traditional bands are warped with their tablets alternately “S” and “Z” threaded (unless the design dictates otherwise). Figure 9: Illustrating why two similarly threaded tablets turn with difficulty. If you look in detail how the threads are moving while the tablets are turned for a pair of neighboring tablets that are threaded similarly, you can see that the threads between the tablets are sliding against each other. (See the left diagram in Figure 9.) The thread through hole 2 in the back tablet and the one through hole 4 in the front tablet rub against each other while turning the tablets. This situation is avoided by threading the tablets alternately “S’ and “Z” as shown in the right diagram of Figure 9. The thread through hole 2 in the back tablet now moves in the same direction as the thread through hole 2 in the front tablet while the tablets are turned. There is a variety of techniques to create color or texture patterns by combining threads of different color in the holes of each tablet with sometimes very complex turning sequences. Brocading distinguishes itself from those in the sense that the pattern is created by an extra weft to create the design. It is discussed in detail and with many historical examples in Chapter 13.2 of Collingwood. The ground weave consists of the warp and the ground or structural weft binding the cords together and hidden in the usual way. 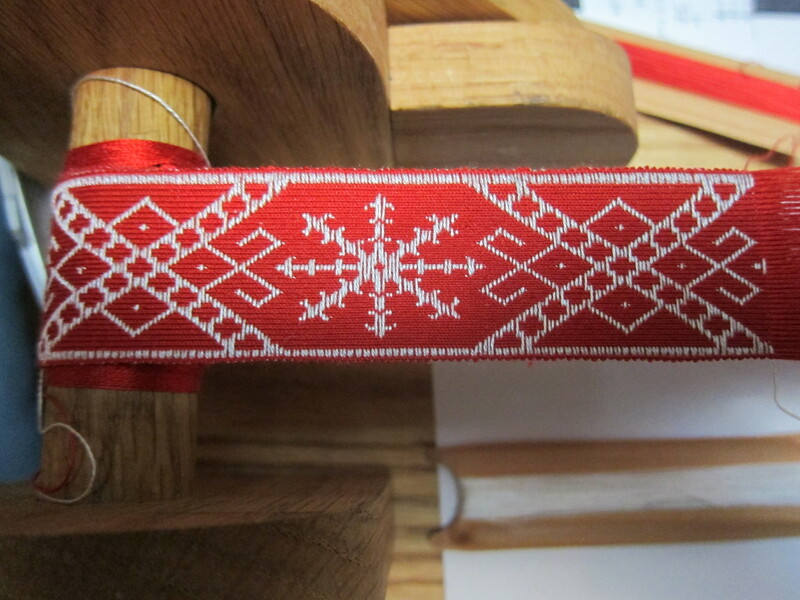 Then there is an extra weft passed at each pick to decorate the surface. This second weft is purely decorative; it has no other function in the woven structure. It lies on top of the band in floats tied down at certain intervals by the warp threads, usually only showing on the top of the band. The tablet woven band merely serves as the support of the brocading weft. The easiest and the most common way for many Anglo-Saxon brocaded bands as well as the Birka bands illustrated in Figure 3 is to tie down the brocading weft under two threads of one or more cords. This means that the brocading weft floats on top of the band, but at intervals dictated by the desired design, it loops under the top two threads through the regular shed for one or more adjacent cords. When the brocading weft passes through the shed it is, like the ground weft, hidden by the warp and thus not visible from either the top or the bottom of the band. So the brocading weft is sometimes visible and sometimes hidden by the warp, giving us an enormous freedom of design. We can chose a brocading thread in a contrasting color from the warp or use multiple colors in different parts of the band. We can even use silver or gold thread for the brocading weft, either as flat metallic silver or gold or wrapped around a core like silk. Most of the Birka bands were woven with gold or silver brocade. The ground weft is typically of the same color as the warp. Since it is always nearly invisible it was often made from a cheaper material like linen instead of silk. It is better to use a thinner ground weft thread to get a nice dense brocading coverage. Alternatively, you can use multiple threads as a single bundle for the brocading weft. Instead of tying the brocading weft by two threads per tablet, you can also go completely around one or more adjacent tablets on the back of the band and then come forward to the front again. This results in a pattern on the back that is the negative of that on the front, which can be more interesting in certain uses for example for a belt. There are a number of ways to treat the selvages. Quite often there was a stave border on both selvages. The brocading weft would always show at say the second and third and the two and one but last tablet and be hidden for the first and the last tablet. It would pass through the end of the shed just like the ground weft. This will show as small “pips” on both sides of the belt. Alternatively, or to avoid the latter, you can bring the brocading weft to the back between the one but last and the last tablet, then turn the tablets and at the next pick come to the front again between the same two tablets. To more easily keep track of each pick, I recommend starting with the ground and brocading weft shuttles at opposite sides of the band. For example, start the ground weft on the left and the brocading weft on the right. Then always pass the brocading weft first, followed by the ground weft. Loop the ground weft over the brocading weft at each pick before passing it through the shed. This is not the only way to do it, but I think that it is less important what method you use than it is by picking one and sticking with it consistently. The rest is simply lots of practice. Below are two examples of my own designs with their brocading diagrams. I make my diagrams in Excel. Setting the row height to 8 and the column height to 1 gives you a nearly square raster that can be colored for tablets where the brocade shows on top and left blank for those where it is hidden by the warp by going through the shed. I cut out an extra “ruler,” the column with numbers all the way on the left. I lay that on the diagram and push it forward one pick at the time. I also number the tablets correspondingly after I warp the loom. That way, I can read the diagram and match the numbers of the tablets where the brocade will show. Figure 10: Two of my own designs with their brocading patterns. My blog has a video that illustrates the brocading process the way I do it. Collingwood, Peter (1982) The Techniques of Tablet Weaving, Echo Points Books & Media (Vermont). Geijer, Agnes (1938) Birka III: Die Textilfunde aus then Gräbern, Kungl. Vitterhets Historie och Antikvitets Akademien (Uppsala). Hoffman, Marta (1974) The Warp-Weighted Loom: Studies in History and Technology of an Ancient Implement, Robin and Russ Handweavers. Peter Collingwood (2015) The Techniques of Tablet Weaving. Peter Collingwood (2015) The Techniques of Tablet Weaving, Plate 5, page 15. Agnes Geijer (1938) Birka III: Die Textilfunde aus then Gräbern. Ibid. Plates 22 and 23. Ibid. Pages 82 and 83. Peter Collingwood (2015) The Techniques of Tablet Weaving, Figure 27, page 54. Ibid. Figure 29, page 56. 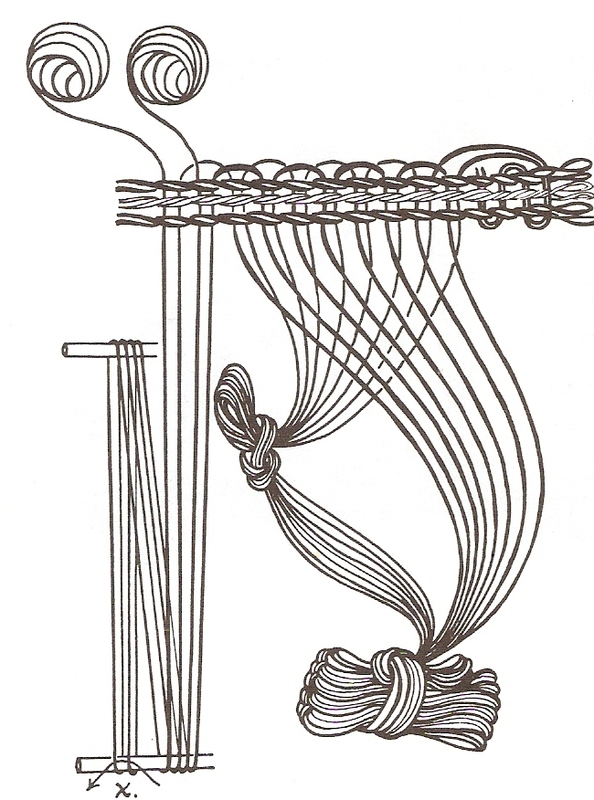 Peter Collingwood (2015) The Techniques of Tablet Weaving, Figure 34, page 57. Ibid. Figure 33, page 57. Peter Collingwood (2015) The Techniques of Tablet Weaving, Figure 35, page 58. For more information, contact THLord Hrolf via his email, and/or see his blog or Academia site.